Satsuma Japanese figure of a man with his monkey companion on his back sitting on a rock. 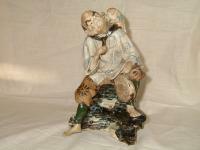 The figure is glazed in certain places. This item has ifantastic detail. 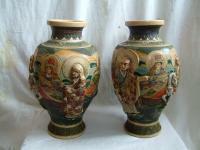 A fine large pair of Japanese satsuma vases in excellent condition made C1900. They are made with exquisite detail and typical of the Satsuma style.